Today, we’re talking to Andre Norton Award finalist, Sarah Beth Durst. Her debut novel, INTO THE WILD, is an adventure that takes you into the heart of the fairy tale world. Years ago, the fairy-tale characters escaped from a magical entity called The Wild. But when The Wild begins to take over again, it’s up to Rapunzel’s daughter Julie (and her foster brother, Puss-in-Boots) to save the day. (Bonus: It’s out in paperback in one month!) The follow up, OUT OF THE WILD, is due out from Penguin Razorbill this summer. Visit Sarah’s website to find out more. Sarah was one of my fellow contributors to the amazing new Teen Libris anthology, Though the Wardrobe, and I had a chance to chat with her about her essay, about Narnia, and about why she names lamp posts. Diana: Tell us a little bit about your essay for THROUGH THE WARDROBE. Sarah: I called my essay “Missing the Point.” It’s about why the Narnia books resonate even if you completely and utterly miss all the symbolism. Kind of emotional support for the clueless. You see, I was clueless for years and years. I read the Narnia books dozens of times as a kid without noticing the slightest hint of religious allegory. Diana: I’m with you there! Not having grown up in a religious household, I missed the symbolism when I read the books at nine. In fact, I vividly remember recommending them to a Jewish schoolmate who told me her parents didn’t let her read “Christian propaganda” and I was shocked, since I never looked at them as anything other than fantasy books. I definitely see a corollary to the way other books might be viewed as “dangerous” or “instructive” by adults, but the kids just see them as pure fun. Sarah: I’m also the kid who completely believed the frame story in The Princess Bride, told all my friends that Inigo Montoya and Princess Buttercup were real historical figures, and then tried to back it up with encyclopedia research. Needless to say, our encyclopedia didn’t mention them. Of course, our encyclopedia was so old that the section on space travel said that maybe someday man will land on the moon…) Anyway, I thought there should be an essay for those of us who are allegorically-challenged. Diana: Ha! I actually wrote into the publisher, as Goldman recommends, to get the “missing love scene.” However, I never received the response that details the various and sundry legal problems Goldman (and the hilarious lawyer, Kermit Shog) dealt with. So you’re not alone in your beliefs! What is your favorite Narnia book? Sarah: I love, love, love the Lion, the Witch, and the Wardrobe. As a kid, I used to check my closet pretty much daily in case it spontaneously opened onto another world. (I also checked it for monsters, but that’s just plain common sense. Everyone knows monsters are attracted to the smell of shoes.) I don’t check the closet quite as often any more, but I do call the lamppost outside my house the Faun Tumnus Lamppost. I think the images and moments in that book imprinted on my brain so early and so strongly that they still, on occasion, influence how I see the world. Diana: I was always a Dawn Treader girl, myself. That’s certainly the one I read the most (I still read it at least once a year, to this day). What Narnia character would you like to be and why? If you were to fall into a Narnian book, which one would it be? Sarah: I’d like to be the talking lion in the Lion, the Witch, and the Wardrobe. I don’t mean Aslan — way too much pressure and expectation there. I mean the random minor character at the end of the book who is overjoyed to help the heroes in the climactic battle. That would be me: not the hero, but totally thrilled to be hanging out around so much magical stuff. Plus it would be fun to be a lion. Diana: I totally remember that lion, how he frolicked around while Aslan released the other stone creatures from the Witch’s castle! Great choice! Sarah: As far as which book, I think I’d want to be in Narnia during The Magician’s Nephew. Safely before the White Witch begins her winter (I wouldn’t like being there in the cold) and safely before the world is destroyed and everyone dies but we’re supposed to be happy about it (I wouldn’t like being there in an apocalypse). Diana: Do not get me started ranting on The Last Battle. And, speaking of things that tick me off about the series, How do you feel about the “new ordering” of the books, and the so-called logic behind it? Are you a “Publicationist” or a “Chronologist”? Sarah: Publicationist!!! Reading The Magician’s Nephew first is like watching a making-of documentary before you see a movie. If you’re re-reading the books, then chronological is fine, but for new readers… One of the coolest moments in the Magician’s Nephew is when you learn the origin of the lamppost. This totally loses all its coolness if you have no idea about the significance of the lamppost. Diana: Ah, a girl after my own heart. (I actually rant a bit about this in my essay.) How do you think that the Narnia books have influenced your own writing? Sarah: One of the reasons that I’ve always loved the Narnia books is that the heroes and heroines are ordinary kids. Peter, Susan, Edmund, Lucy, Jill Pole, Eustace… none of them have special powers or are revealed as the long-prophesied Chosen One. I like that. Julie, the heroine of my novels, INTO THE WILD and OUT OF THE WILD, is completely ordinary. Okay, yes, she’s the daughter of Rapunzel, but Julie didn’t get any magical fairy-tale powers out of the deal. In fact, the whole fairy-tale thing just makes her life more complicated. You think your family is embarrassing? Wait until you have dinner with the seven dwarves. Anyway, I know my fondness for stories that involve ordinary characters facing impossible odds stems from the Narnia books. Diana: That’s true. Modern fantasy does seem to be chockers with Chosen Ones. However, aren’t the Pevensies prophesized? Four thrones at Cair Paravel, etc.? Still, they have no special powers, and that makes it very accessible to you normal people who can’t do magic… Um, was that out loud? Moving on. How did you like the first Narnia movie? What are your plans for the release of Prince Caspian? Sarah: I loved the first Narnia movie, and I can’t wait for Prince Caspian. My plan involves popcorn. Lots of popcorn. And a soda, but not a large soda because I don’t want to have to sneak out mid-movie in search of a bathroom. Very important to be careful of such things. I practically dehydrated myself to make it through Lord of the Rings. Anyway, soda or not, I’ll definitely be there! Sarah: Thanks for all the great questions, Diana! Diana: And thanks for coming, Sarah! 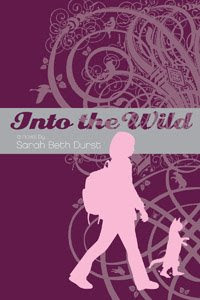 To all the readers: In honor of Sarah’s visit, I’m giving away a copy of her debut, INTO THE WILD. Leave your name and your favorite Narnian moment in the comments section to be entered into the drawing, and stay tuned for more Narnia coverage and giveaways. Thirteen years in Catholic school (k-12) plus six years TEACHING in Catholic school and semi-regular church attendance and I still didn’t see the religious allegory in LWW. I wasn’t looking for it. I was just reading a story to my daughter that I’d somehow missed as a child. We’re going to re-read it now before we read PRINCE CASPIAN. I guess I’ll look this time! Great interview. I’m looking forward to the book. Is it still unavailable to order online? Julie, it’s curious. The books are released as Borders exclusives. the last time, you could go to the Borders online store (*different* from the one run through Amazon) and order the Golden Compass one, but this time, they don’t seem to have a link. I’ve searched and searched. I think it may be because last time the Borders website did a big promo interview with Scott about the book. However, I see the Wardrobe book in the actual STORES all the time. So you *can* get it there. YAY! Two other intelligent people who did not see the allegory in the Narnia books, AND believed the PB frame story. My favorite recent Narnian moment is when I saw the preview for the Narnia movie in the theatre, and started crying, right there, because I could tell they’d gotten it right. 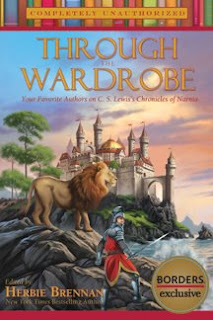 My favorite Narnia book is the Lion, the Witch and the Wardrobe. I read it when I was about 10 and totally missed the religious aspects until I was an adult. I love the whole book, but really love when Lucy first goes to Narnia. I might re-read LWW before I re-read Prince Caspian. I need to have the story fresh on my mind before I see the movie. For me, looking for author-intended allegory limits rather than enhances my enjoyment of literature. It’s like someone standing beside you in an art gallery and telling you what a painting “means,” although what you saw in it could be totally different. The debate has raged for 40 years over the allegory of Lord of the Rings –is it WWI, is it the Holocaust, is it a greater political statement, is it Christianity? I love the books (and the film adaption) and I really don’t care about a historical or theological reference point. For me, the Narnia books will always be a wonderful and imaginative story. Even if C.S. Lewis intended the work to be allegorical, IMO a work stands on its own irrespective of its creator’s intentions, and a reader’s interpretation shouldn’t be limited by anyone else’s persepctive — not even the author’s, lol. Just my 2 cents. I agree, Phyllis. Once something is out in the world, it stops being “what it’s intended to be” and starts being what it is. Tough on artists perhaps, but them’s the breaks. Also, I don’t usually recommend audio books, but I can’t recommend highly enough the Narnia series on audio as read by some of Britain’s lead actors: Patrick Stewart, Lynn Redgrave, Jeremy Northam, Michael York, Kenneth Brannagh…. quite amazing. Oh my God, I’m so glad I’m not the only person who fell for the Princess Bride frame story. Caspian is my favorite Narnia book, so I’m excited for the movie. I went to a Christian school, so every year we read or watched something about Narnia and had long discussions about religious allegory. I’ve only read LWW and TMN because my hubby got me the series all in one book and it’s printed chronologically, so dang, I missed out on the making-of-lamppost symbolism. I plan to go read the rest of them, but I just haven’t. I got stuck halfway through the next one… oh what is it, with the horses? Enjoyed the first movie and I’m eagerly awaiting the second! I remember getting this book to read as an assignment in high school. It was one of the few times I enjoyed doing homework. I read the whole book ahead of the class and got every question correct on the quiz’s that followed it. My favorite Narnia moment is impossible to pick as I loved the whole book/series. The movie also was great. One of the few times a book came to life on the screen and really captured what the author wrote. Yes! Absolutely! It was Lewis’s crystal-clear intention – just look at the dust jacket blurb of Prince Caspian where it states clearly, “This is the second in the Narnia series,” or words to that effect. I mean, duh! Having just reread Prince Caspian this morning, my favorite Narnian moments today come from this book: the slow recognition scene of the crumbled ruin as Cair Paravel; the rediscovery of the Gifts in the treasury; Lucy’s encounter with Aslan; Peter’s wonderfully-worded challenge to Miraz; and of course Caspian telling Aslan he’s not ready to be king – “I’m just a kid” – which proves that he is the true King after all. And I’m with all of you on the ordering of the Narnia books! I received the C.S. Lewis box-set for Christmas one year as a child, which ended up being a blessing. I ended up getting really sick and missed two weeks of school. I read all seven books to help pass the time. But I guess I did love the feeling around Digory’s and Polly’s discovery of the Wood Between the Worlds. I so want to find something like that. So calm and happy yet full of promise–as long as you don’t fall asleep there! P.S. I freely admit to never having seen the allegory, and even now that I know what to look for, I don’t care. I loved the books, flawed or not, and I always will. Too bad my set are at my mom’s house. And yes, let’s keep them in the original order! That’s part of the magic. We’re smart enough to be able to connect the threads on our own, thanks.